You are currently browsing the tag archive for the ‘baby-led weaning’ tag. None of my three daughters have been interested in baby food. After my first was born, I decided not to fool with it at all. So, with Ivy and Gwen and by default with Deladis, I have practiced baby-led weaning. The term “weaning” is used in the British sense on this website and does not mean ending nursing (breastfeeding). It simply means introducing solid foods. Deladis’ first swallowed food was cucumber. Ivy’s was avocado, and Gwen’s was peas. For Gwen, it is more about exploring the texture and the taste of the food. She rarely swallows it. I have noticed her increasing the amount going in to the stomach little by little. I also do child-led weaning. “Weaning” in this use means end of nursing. Child-led means that the child dictates when the breastfeeding relationship will end unless the mother becomes uncomfortable and ready to wean prior to that time. Deladis stopped nursing at 2 years and 6 months. Ivy did at 2 years and 2 months. It worked out beautifully for our family. My girls have rarely needed antibiotics and are generally very healthy and strong. I love nursing my babies and fortunately I’ve had an relatively easy go of it. With Deladis I had some difficulties in the beginning, but once they were worked out, I had no more problems. The key is when problems do arise to seek help if your remedies do not solve the problem. Child-led weaning is actually in tune with the American Academy of Pediatrics breastfeeding recommendations. “Breastfeeding and the Use of Human Milk,” published in the March 2012 issue of Pediatrics (published online Feb. 27), the American Academy of Pediatrics (AAP) reaffirms its recommendation of exclusive breastfeeding for about the first six months of a baby’s life, followed by breastfeeding in combination with the introduction of complementary foods until at least 12 months of age, and continuation of breastfeeding for as long as mutually desired by mother and baby. 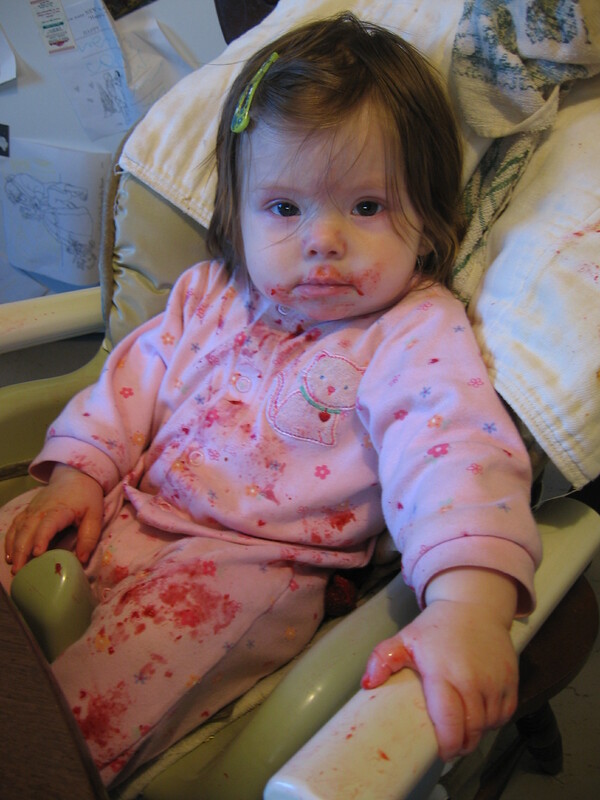 Anyhow… all this to say that this is what baby-led weaning looks like in our home. 🙂 Happy Sunday! Yep, I “gommed” up a strawberry. And now I get a bath in front of some nice moist heat and a picture window looking out on the sunny Sunday! An Appalachian woman born and raised, mothering two little girls in a place that is non-existent to AT&T or UPS. Happily working toward a sustainable lifestyle and writing on the demand of a loud muse. I ask that you please ask for permission before copying any pictures from this site. I don't mind using quotations in part from the text (please link to this site), but if you would like to use a whole text, please contact me. I want to be generous, but I would also like to know who is using this content. Thank you!